I replied: “Hi Lindsay, first take the Malaga airport bus to Marbella bus station. When you get there, change to the Marbella to Estepona bus. If you are arriving at Malaga airport after 8pm the ticket office is closed. You’ll have to get your ticket from the driver. At the Marbella bus station, get in the queue for your ticket on the next bus to Estepona and say to the ticket seller “Guadalmina.” You can add – por favor- if you feel better but in Spain it’s not used very much. The ticket seller is being paid to give you a ticket, why do you have to say please? Welcome to Spain. You can get off at the Guadalmina Commercial Centre bus stop on the inland side of the road but Guadalmina is actually an enormous urbanisation. 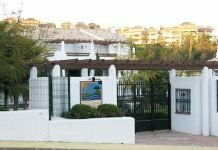 Guadalmina Baja is on the sea side of the road and Guadalmina Alta is on the mountain side of the road around the golf course. 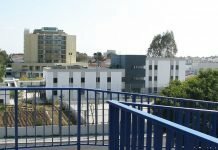 I would recommend, for the first time anyway, that you get off the Marbella to Estepona bus at the San Pedro de Alcántara bus stop. From the taxi rank there take a taxi to your villa in Guadalmina. If your villa is close to the main A7 coastal road, you can then use the bus to commute up and down the coast during your stay. In the picture above you can see La Concha, the mountain behind Marbella. The Marbella to Estepona bus has just stopped at the bus stop in front of Guadalmina Commercial centre. When you are travelling on the bus towards San Pedro de Alcántara or Puerto Banus or Marbella use the bus stop over on the right of the picture. Behind eucalyptus trees is Guadalmina Baja. 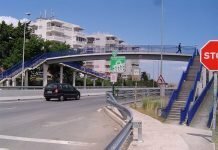 There is a footbridge connecting the two Guadalmina Commercial Centre bus stops which appear on the list of bus stops connecting Marbella and Estepona. Next articleMijas Costa or Mijas Pueblo? Hi Sharon, thanks for writing in. You can indeed book your tickets in advance. The price now is just on €8 one way and it will probably be about that in July this year. That would be around €24 for the three of you. It takes exactly 43 minutes from the airport to Marbella bus station. I'll give you a link to the Gomarbella bus travel page where you can do your bookings online https://www.gomarbella.com/book-your-bus-ticket-from-malaga-airport-to-marbella-bus-station/ There are not many services in the winter schedule but at the beginning of June, the summer schedule will come in to operation and there will be lots more services every day between the airport and Marbella and back. Hi can tell me how much it would cost on airport bus from malaga to marbella in july for 1 adult and 2 teens and how long does it take and can you pre book your seat? Hi, I checked on the Gomarbella online booking page putting in Marbella as the Origin and Madrid as the Destino and came up with nine services for the 28th August. Have a look at them all and see which one would suit you best. The bus that leaves Marbella at 22.00 on 28/8 gets into Madrid Estacion Sur at 05.15 in the morning of 28/8. We would then need to check how long it would take you to get to Madrid Airport from the big Estacion Sur to get your flight at 07.40. I don't know the answer right now but I'll help you find out. Please check out the possibilities and tell me what your thoughts are. Good question about only in Spanish! Beats me when we have so many visitors from outside the country. You can book your bus travel tickets online right here and of course I am available to help with the booking process. Im flying from Madrid 07:40am on the 29th of August. Im trying to find a bus from Marbella to Madrig but can't work their website (how can it be only in spanish??) . It doesnt state how long the bus takes only what time it's departing, same for the link on gomarbella. Help please !